This morning, at the end of my drive into work, I heard the sound of church bells. 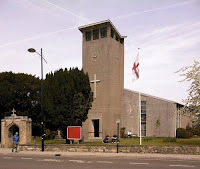 St George's Church is within earshot of my office - and today being St George's Day, the church was doing its patriotic best to annoy me. I like church bells. The idea of enthusiastic, sweaty campanologists exerting themselves in not-quite-perfect synchronism is a splendid concept, and imagining a group of them in earnest, muscular concentration at the foot of St George's modern bell-tower should have brought a patriotic glow to the cockles of my cynical heart. But it didn't, because I knew that these were not real bells. The cacophonous impingement on my morning serenity was likely initiated by someone pressing a button - or perhaps even by a pre-programmed timer*. So what, you ask? Why should it bother me that these were not real bells? Because I care about what is and isn't real; about what's true and what's false. Because every single fake thing calls into question the genuine article. But maybe I shouldn't be surprised - this noise was coming from a church. Fake bells from a fake god - what did I expect? *Actually this is more probable, as the 15-minute ear-assault was repeated at 12 noon and 3 pm (and for all I know 6 pm as well, though I'd escaped by then). Who needs an ultimate authority?